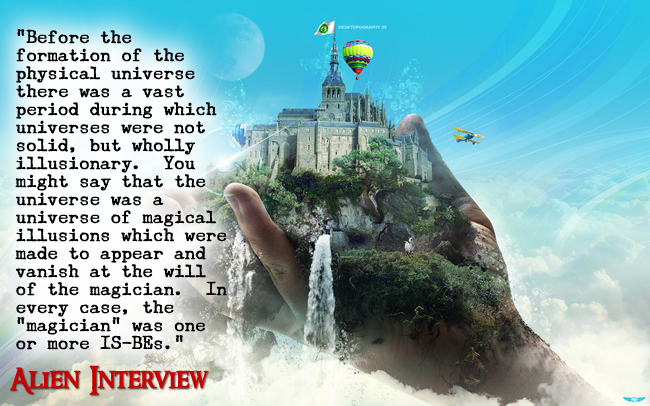 “Airl explained that IS-BEs have been around since before the beginning of the universe. The reason they are called “immortal”, is because a “spirit” is not born and cannot die, but exists in a personally postulated perception of “is – will be”. She was careful to explain that every spirit is not the same. Each is completely unique in identity, power, awareness and ability. The difference between an IS-BE like Airl and most of the IS-BEs inhabiting bodies on Earth, is that Airl can enter and depart from her “doll” at will. She can perceive at selective depths through matter. Airl and other officers of The Domain can communicate telepathically. Since an IS-BE is not a physical universe entity it has no location in space or time. An IS-BE is literally, “immaterial”. They can span great distances of space instantly. They can experience sensations, more intensely than a biological body, without the use of physical sensory mechanisms. An IS-BE can exclude pain from their perception. Airl can also remember her “identity”, so to speak, all the way back into the dim mists of time, for trillions of years! She says that the existing collection of suns in this immediate vicinity of the universe have been burning for the last 200 trillion years. The age of the physical universe is nearly infinitely old, but probably at least four quadrillion [i] (Footnote) years since its earliest beginnings. The physical universe itself is formed from the convergence and amalgamation of many other individual universes [iii] (Footnote) , each one of which were created by an IS-BE or group of IS-BEs. The collision of these illusory universes commingled and coalesced and were solidified to form a mutually created universe. Because it is agreed that energy and forms can be created, but not destroyed, [iv] (Footnote) this creative process has continued to form an ever-expanding universe of nearly infinite physical proportions. Before the formation of the physical universe there was a vast period during which universes were not solid, but wholly illusionary. You might say that the universe was a universe of magical illusions which were made to appear and vanish at the will of the magician. In every case, the “magician” was one or more IS-BEs. Many IS-BEs on Earth can still recall vague images from that period. Tales of magic, sorcery and enchantment, fairy tales and mythology speak of such things, [v] (Footnote) although in very crude terms. Each IS-BE entered into the physical universe when they lost their own, “home” universe. That is, when an IS-BE’s “home” universe was overwhelmed by the physical universe, or when the IS-BE joined with other IS-BEs to create or conquer the physical universe. Airl — Pilot, Officer and Engineer of The Domain Expeditionary Force. From the transcripts published in Alien Interview.